Most of us have already tried Edge, decided we didn’t like it and opted not to use it. Normally, that would be the end of the story, but that would be forgetting that Microsoft generally refuses to take “No” for an answer. Windows 10 felt in many regards like an operating system that was not ready for release back when Microsoft released it. This was the case for the new system browser Microsoft Edge as well, as it lacked a lot of features. While it was highly optimized, it felt like a browsing shell more than a full browser in many regards. Microsoft worked on improving Edge, and it did so over time by introducing new functionality such as browser extensions. This is not the only ad that promotes Microsoft Edge that users may see however. Microsoft is pushing ads in the Action Center as well stating that Chrome is draining battery fast and that switching to Edge would better the situation. Both ads have some use for users and try to promote a feature of Microsoft Edge or Microsoft that may be beneficial to users. One could argue that this is a good thing, and it probably would not get such a bad reception if Microsoft would provide clear and concise options to turn of these after they appear once. The main issue that many Windows 10 users may have with these ads is however that is seems impossible to get rid of those advertisements once and for all. While you can turn off the Windows Customer Experience Program and several ad-related preferences in the Settings application, there is no guarantee that these changes will stick through updates. Changes to custom user settings do one thing more than anything else: they irritate users. I cannot say how many users are enticed by the ads to switch to Microsoft Edge or at least give it another try. 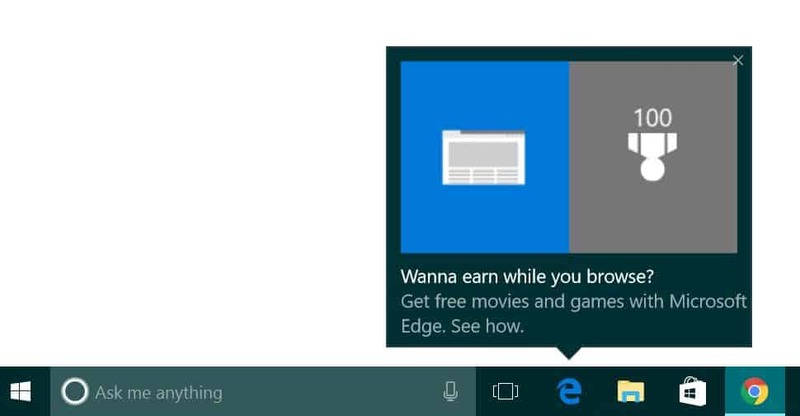 For now, the only 100% way of making sure you don’t get these ads seems to be to start using Edge. This entry was posted on Friday, November 4th, 2016 at 10:30 am	and is filed under General News. You can follow any responses to this entry through the RSS 2.0 feed. Both comments and pings are currently closed.